Bible Call is a Free Public Service Religious Information Library consisting of hundreds of five-minute recorded messages on a wide variety of Bible subjects. The material was carefully researched and written by over one hundred prominent religious leaders from across the nation. The Bible Call Library makes it possible for anyone wishing to study the Bible to locate information on almost any important topic quickly and accurately. 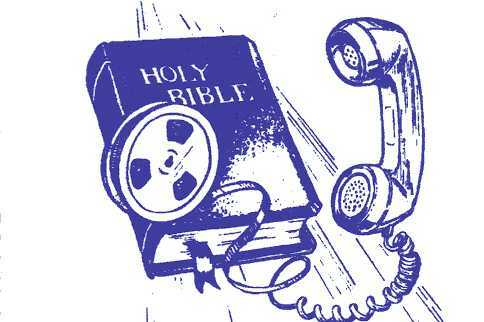 Since Bible Call is now completely automated, it is available twenty-four hours a day, seven days a week. Just call the number listed above from any Touch-Tone phone and follow the instructions given. Select the subjects you would like to hear from the list below and request each topic by its number. 201 Why Does God Allow Trouble? 220 How Does A Christian Handle A Cancer Operation? 226 Are You Thinking About Suicide? 301 What Must I Do To Be Saved? 304 Are We Saved By Faith Only? 310 Who Should Be Baptized? 311 What If I Have Been Baptized Unscripturally? 312 How Do You Know You Have Been Saved? 315 Is Everyone Entitled To His Own Belief? 317 What About The Thief On The Cross? 318 Is Conscience A Safe Guide? 319 For What Should An Alien Sinner Pray? 323 Why Be A Christian? 325 How Can Man Be Justified With God? 327 Is Church Membership Essential? 329 Do People Really See Visions Today? 333 Does It Matter What We Believe As Long As We Are Honest? 334 Should I Have My Baby Baptized? 339 Who Is This Man Jesus? 405 Divorce: Is It Really The Answer? 503 Is The Bible God's Only Inspired Revelation? 505 Can You Really Prove "Anything" By The Bible? 515 Can Ordinary People Understand The Bible? 521 Is There A Pattern? 522 Do We Really Have The Bible Today? 523 Did The Bible Come From God Or From Man? 552 The Sabbath Or The Lord's Day - Which? 555 Should The Lord's Supper Be Observed Every Sunday? 558 Will A Man Rob God? 560 Whose Prayer Will God Hear? 602 Why Are There So Many Different Churches? 607 The Church: Is Attendance Essential? 609 Unity Or A Return To the Original Church? 610 Which Is The Right Church? 611 How Is The Church Identified? 616 What Does The Bible Say About The Clergy & Laity? 618 Christ - Yes! The Church - No! 624 How Many Churches Did Jesus Build? 657 What Is Hell Like? 701 God Or Matter - Which? 704 Evolution - What Do The Fossils Say? 751 Was Christ Actually Raised From The Dead? 754 Does God Really Exist? 764 Why Christianity In Preference To Other Religions? 902 Situation Ethics: Does Love Make Our Wrongs Right? 903 Are You Thinking Of Having An Affair? 909 What Is Wrong With Gambling? 911 Is It Right To Dance? 957 Who Could Work Miracles? 958 What Does The Bible Say About Capital Punishment? 970 What Is Satan Really Like?